Mel Vedere is located in the lovely village of Shellharbour close to beaches, ocean pools, new childrens playground, new skate park, cafe's, restaurants, clubs and pubs. 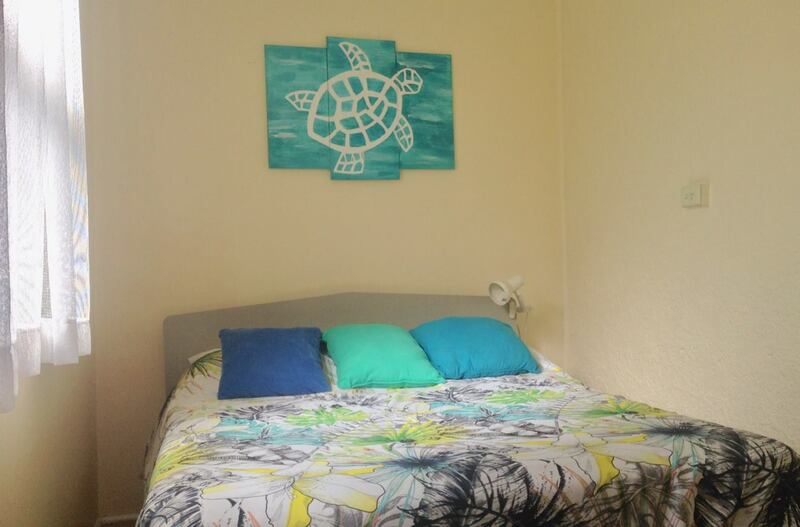 This neat and tidy 2 bedroom home with a third 'open ' bedroom of the lounge-room comfortably accommodates a maximum of 6 people (4 adults and 2 children) and is excellent value for the budget conscious family looking for holiday accommodation in one of the most popular tourist areas on the South Coast. Laundry is internal but has no washing machine. Linen is NOT supplied. Guests must bring their own sheets, towels, doonas & pillows. Rates - are based on a family of 2 Adults and 3 children. Fees apply for additional persons. Minimum stays of 4 nights apply except during School Holidays where a minimum of 5 night booking is required. The property features a fully equipped kitchen, spacious lounge and and outdoor sitting area within a fenced yard. With only a short walk to the restaurants, cafes and boutique shopping of Shellharbour Village, it's the perfect place to base yourself for your Shellharbour holiday. Take the Shell Cove Exit from The Princes Hwy. Travel along Shellharbour Road for approximately 1.8kms. Turn right at the traffic lights into Addison Street, Shellharbour Village. LINEN IS NOT PROVIDED, YOU WILL HAVE TO BRING YOUR OWN. Room 1 Queen bed, Room 2 double bed, and the open bedroom off the lounge room has 2 single beds (there is no door to this room). Full kitchen, oven, stove, microwave, dining room, bbq, outdoor area, no air conditioning, pedestal fans. BOND A security deposit (bond) of $400 is payable by the guest to the property owner at least 14 days prior to arrival. The bond is to cover any additional costs incurred as a result of breach of the Holiday Rental Agreement including any breakage damage or excess cleaning requirements which occur due to the guests occupying the premises. Upon departure the property will be inspected. The bond will be refunded via direct deposit subject to the terms and conditions being met and provided the property is left in the same condition as it was prior to the holiday occupancy. CANCELLATION POLICY Where a minimum of three months notice is given of a cancellation of a booking a full payment will be refunded less a $50 booking/transaction fee. If less than three months notice is given payment is forfeited unless the property is re-let for the full term of the booking. If the property is rebooked for only part of the original booking dates then a pro rata refund will be made at the property owners discretion less a $50 booking/transaction fee. Any refund applicable because the property has been rebooked will be made after the dates of the original booked dates. No refunds of any unused portions of a holiday rental are given. LINEN: Linen is NOT supplied. Guests much bring their own linen. 1X Queen bed 1x Double bed 2x singles beds – fitted and flat bed sheets pillow cases towels bath mats tea towels toilet requirements cleaning agents etc. PRICES & FEES prices quoted are in Australian dollar. Bank transfers are available for international travellers in which case bank fees may apply. All associated bank fees and charges are payable by the guest. DEPOSIT /PAYMENT Payment of a booking deposit or balance constitutes the clients acceptance of all Terms and Conditions. Payment can be made by cheque or bank order or direct into a nominated account.